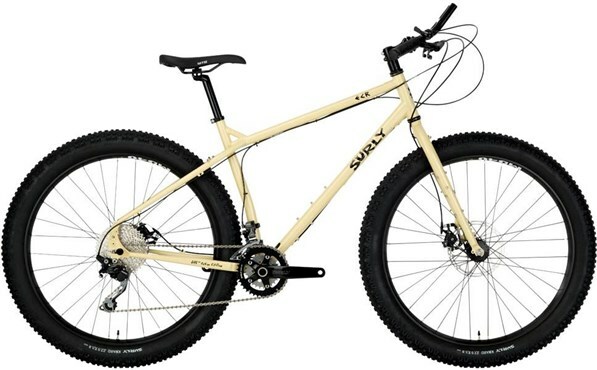 The Surly ECR Plus is an adventure bike built for fun. The 29er+ wheels have large 3.0” tyres to add both cushioning and traction, allowing you to travel on harsh terrain without worry. The Cromoly steel frame is strong and able to take on years of riding, and features a huge amount of mounting points to add all your essential gear for trekking into the mountains. The Shimano SLX/Deore drivetrain is reliable and built to last. Those familiar with this steel mule know it’s designed around plus tires, previously of the 29” variety. A fully loaded 29+ bike is an excellent way to explore and get away for a while… if you’re of a certain stature that is. For smaller riders, it poses several challenges though. And no one wants new problems when they’re in the woods trying to escape old ones. To solve this, we redesigned the smaller sizes of the ECR to work with 27.5+ while the larger sizes are still equipped with 29+. All you medium specimens out there get your pick of the litter as we’re offering that size in both options. So way to just be average I guess.